Last Sunday, my wife, Peggy and I met with an old friend, Steve Anderson. We had all been involved in Jaycees in the 1970s. Steve remembered that he had been our club’s State Director. It was his job to involve our members with other Jaycee clubs in our region. We were having lunch at the Topside in Steilacoom. Since it was in October we weren’t sitting topside, we sat in the bar. Joining Steve was his son James, and Steve’s cousin, Mike. Peg and I were strangers to James and Mike, so we chatted about our lives and our history with Steve who once even took Peg’s younger sister to a dance. 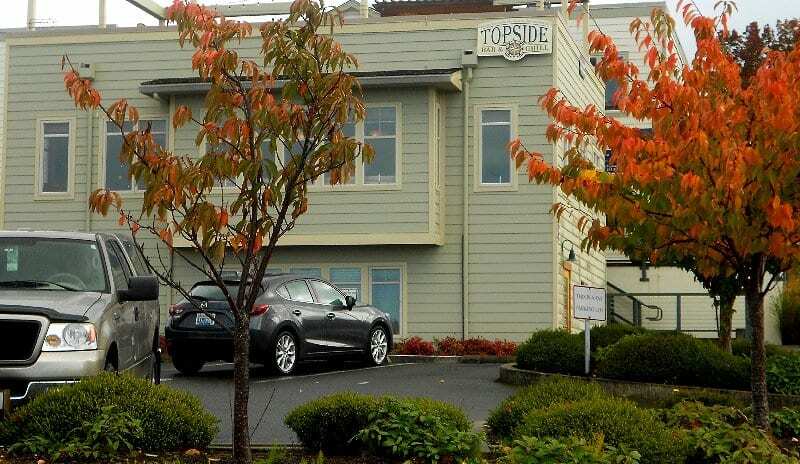 We were having lunch at the Topside in Steilacoom. Since it was October we weren’t sitting topside, we sat in the bar. Much of our earlier history was with the Jaycees (Junior Chamber of Commerce) and so eventually the conversation circled back to Jaycees. In the bar we had almost a direct view of McNeil Island. McNeil had their own Jaycee organization. Over the years Peg and I had been there a number of times. You didn’t take the ferry to McNeil, there was special boat that took us directly to the dock at the prison. Peg remembered once having to remove her shoes, because the metal detecting rod buzzed going over her buckles. When the wand did the same thing with her dress, she refused to remove her jumper, which also had buckles. They let her in, anyway. She always looks so innocent. In the bar we had almost a direct view of McNeil Island. Each time I visited McNeil I would repeat to myself, “It’s just a short visit . . . it’s just a short visit.” That was easy to say, but when that barred door clanged shut, you just knew you were locked up for good. McNeil was a federal prison, so many of the people incarcerated there were for white color crime. I also visited a Jaycee chapter in Walla Walla at the prison there. They had violent offenders there, but when you’re locked up the feeling is the same. Your world is small and contained. Inmate members were always happy to see us. Part of the Jaycee program was leadership training. Parole boards like to see potential parolees learning skills to keep them out of prison. Another aspect of Jaycees was improving our community. I had forgotten about the photographs, but Steve had not. The McNeil Jaycees had their own fundraising program. When fellow inmates had visitors, the McNeil Island Jaycees would photograph them using a Polaroid camera, which took instant photos (they developed within 60 seconds). The members didn’t charge very much, but they did make a little profit and the service was popular, so the McNeil Island Jaycees could afford to purchase leadership manuals and such. Think of day to day existence where nothing seems to change. But then imagine, that little service of an instant photograph made life more bearable for inmates, their families, and their friends and thereby improved their community. Who are we to judge? We enjoyed ourselves, but it’s still nice to remember the little things that we did right . . . and sharing the joy of community behind bars . . . making life a little better . . . even for just a few minutes. Steve, Peg, me, and our friends always had fun, but we were serious about helping others and our own community as well. Our oldest friends were all part of that group that created the Tacoma-Pierce County Christmas House, the Bacon Bowl, and numerous other projects that made Tacoma and Pierce County a better place to live. We enjoyed ourselves, but it’s still nice to remember the little things that we did right . . . and sharing the joy of community behind bars . . . making life a little better . . . even for just a few minutes. Lovely true life commentary on the benefits of volunteering, especially to our incarcerated persons, and those who serve them. Lived on McNeil in the 1970s, and community engagement made all the difference.